Triangle trading setup with MT4 it's a simple and profitable method for trading with this pattern formation (triangle) programmed by the famous trader and developer Xard777. In this template we have the triangle with 123 pattern. Financial Markets: Currency pairs, Commodities ( Gold , Silver ,oil) and Indicies. You can trade with this method also with binary options high/low. MT4 Stochastic (50, 13, 2). In the folder we are two templates: for forex and gold. 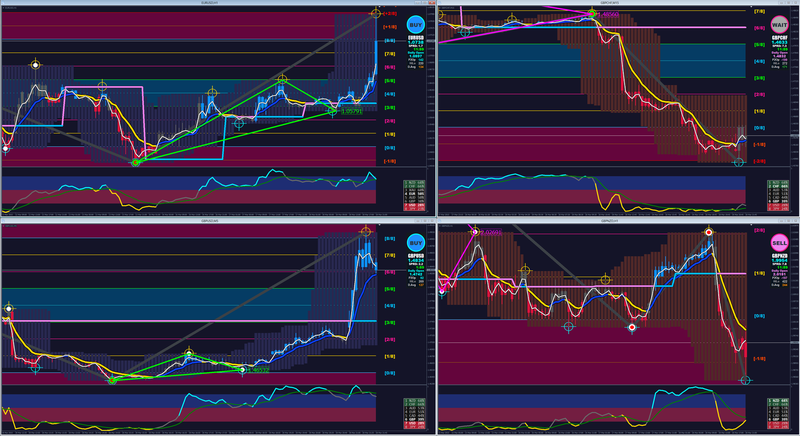 When triangle green is formed wait the the Stoch line to crosses upward the Mid level and the white priceline to crosses upward the Blue/Yellow line. When triangle red is formed wait the the Stoch line to crosses downward the Mid level and the white priceline to crosses downward the Blue/Yellow line. In the pictures triangle trading in action. Could you explain more : "wait the the Stoch line to crosses upward the Mid level"
hi! may i know this system suitable for longer time frame ? Triangle trading setup with MT4 it's a simple and profitable method for trading with this pattern formation (triangle) programmed by the famous trader and developer Xard777.